Why did you break little helper? this new version of it is trash and does not help at all. most do not work like Jackpot, alchemy & arena. and if you try to do Alchemy;manually it will start to use diamonds with no warning. It does not drop the number of attempts after each click. I play on S66 Amora. 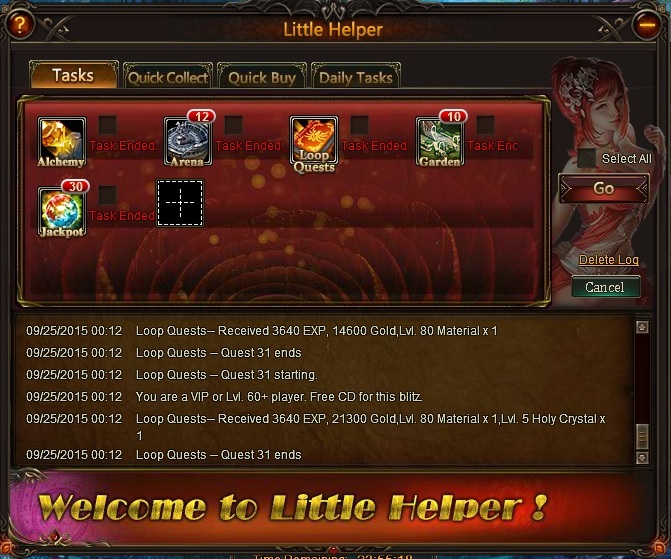 Please fix or better yet remove the so called update to little helper. GIVE US BACK OLD LITTLE HELPER WHICH ACTUALLY WORKED! open LH->task, use 1 click and the garden will appears. Tarot are on quick collect tab. 2019-4-21 16:51 GMT+8 , Processed in 0.054740 second(s), 40 queries .